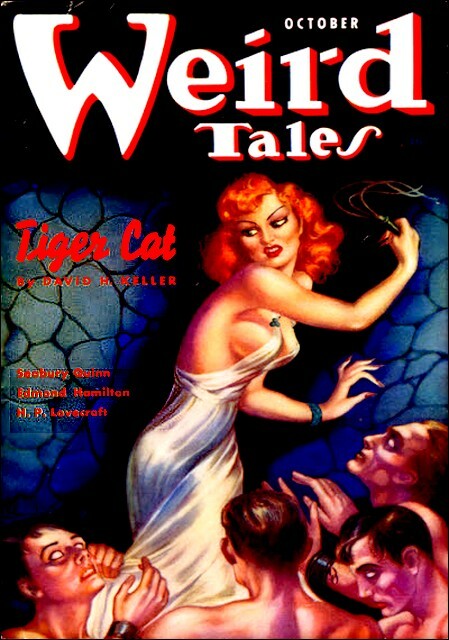 Weird Tales, October 1937, with reprint of "The Shunned House"
FROM even the greatest of horrors irony is seldom absent. Sometimes it enters directly into the composition of the events, while sometimes it relates only to their fortuitous position among persons and places. The latter sort is splendidly exemplified by a case in the ancient city of Providence, where in the late forties Edgar Allan Poe used to sojourn often during his unsuccessful wooing of the gifted poetess, Mrs. Whitman. Poe generally stopped at the Mansion House in Benefit Street—the renamed Golden Ball Inn whose roof has sheltered Washington, Jefferson, and Lafayette—and his favorite walk led northward along the same street to Mrs. Whitman's home and the neighboring hillside churchyard of St. John's whose hidden expanse of eighteenth-century gravestones had for him a peculiar fascination. Now the irony is this. In this walk, so many times repeated, the world's greatest master of the terrible and the bizarre was obliged to pass a particular house on the eastern side of the street; a dingy, antiquated structure perched on the abruptly rising side hill, with a great unkept yard dating from a time when the region was partly open country. It does not appear that he ever wrote or spoke of it, nor is there any evidence that he even noticed it. And yet that house, to the two persons in possession of certain information, equals or outranks in horror the wildest phantasy of the genius who so often passed it unknowingly, and stands starkly leering as a symbol of all that is unutterably hideous. The house was—and for that matter still is—of a kind to attract the attention of the curious. Originally a farm or semi-farm building, it followed the average New England colonial lines of the middle eighteenth century—the prosperous peaked-roof sort, with two stories and dormerless attic, and with the Georgian doorway and interior paneling dictated by the progress of taste at that time. It faced south, with one gable and buried to the lower windows in the east ward rising hill, and the other exposed to the foundations toward the street. Its construction, over a century and a half ago, had followed the grading and straightening of the road in that especial vicinity; for Benefit Street—at first called Back Street —was laid out as a lane winding amongst the graveyards of the first settlers, and straightened only when the removal of the bodies to the North Burial Ground made it decently possible to cut through the old family plots. At the start, the western wall had lain some twenty feet up a precipitous lawn from the roadway; but a widening of the street at about the time of the Revolution sheared off most of the intervening space, exposing the foundations so that a brick basement wall had to be made, giving the deep cellar a street frontage with the door and two windows above ground, close to the new line of public travel. When the sidewalk was laid out a century ago the last of the intervening space was removed; and Poe in his walks must have seen only a sheer ascent of dull grey brick flush with the sidewalk and surmounted at a height of ten feet by the antique shingled bulk of the house proper. The farm-like grounds extended back very deeply up the hill, almost to Wheaton Street. The space south of the house, abutting on Benefit Street, was of course greatly above the existing sidewalk level, forming a terrace bounded by a high bank wall of damp, mossy stone pierced by a steep flight of narrow steps which led inward between canyon-like surfaces to the upper region of mangy lawn, rheumy brick walls, and neglected gardens whose dismantled cement urns, rusted kettles fallen from tripods of knotty sticks, and similar paraphernalia set off the weather beaten front door with its broken fanlight, rotting Ionic pilasters, and wormy triangular pediment. What I heard in my youth about the shunned house was merely that people died there in alarmingly great numbers. That, I was told, was why the original owners had moved out some twenty years after building the place. It was plainly unhealthy, perhaps because of the dampness and fungous growth in the cellar, the general sickish smell, the draughts of the hallways, or the quality of the well and pump water. These things were bad enough, and these were all that gained belief among the person whom I knew. Only the notebooks of my antiquarian uncle, Dr. Elihu Whipple, revealed to me at length the darker, vaguer surmises which formed an undercurrent of folk-lore among old-time servants and humble folk, surmises which never traveled far, and which were largely forgotten when Providence grew to be a metropolis with a shifting modern population. The general fact is, that the house was never regarded by the solid part of the community as in any real sense "haunted." There were no widespread tales of rattling chains, cold currents of air, extinguished lights, or faces at the window. Extremists sometimes said the house was "unlucky," but that is as far as even they went. What was really beyond dispute is that a frightful proportion of persons died there; or more accurately, had died there, since after some peculiar happenings over sixty years ago the building had become deserted through the sheer impossibility of renting it. These persons were not all cut off suddenly by any one cause; rather did it seem that their vitality was insidiously sapped, so that each one died the sooner from whatever tendency to weakness he may have naturally had. And those who did not die displayed in varying degree a type of anemia or consumption, and sometimes a decline of the mental faculties, which spoke ill for the salubriousness of the building. Neighboring houses, it must be added, seemed entirely free from the noxious quality. This much I knew before my insistent questioning led my uncle to show me the notes which finally embarked us both on our hideous investigation. In my childhood the shunned house was vacant, with barren, gnarled and terrible old trees, long, queerly pale grass and nightmarishly misshapen weeds in the high terraced yard where birds never lingered. We boys used to overrun the place, and I can still recall my youthful terror not only at the morbid strangeness of this sinister vegetation, but at the eldritch atmosphere and odor of the dilapidated house, whose unlocked front door was often entered in quest of shudders. The small-paned windows were largely broken, and a nameless air of desolation hung round the precarious paneling, shaky interior shutters, peeling wallpaper, falling plaster, rickety staircases, and such fragments of battered furniture as still remained. The dust and cobwebs added their touch of the fearful; and brave indeed was the boy who would voluntarily ascend the ladder to the attic, a vast raftered length lighted only by small blinking windows in the gable ends, and filled with a massed wreckage of chests, chairs, and spinning-wheels which infinite years of deposit had shrouded and festooned into monstrous and hellish shapes. But after all, the attic was not the most terrible part of the house. It was the dank, humid cellar which somehow exerted the strongest repulsion on us, even though it was wholly above ground on the street side, with only a thin door and window-pierced brick wall to separate it from the busy sidewalk. We scarcely knew whether to haunt it in spectral fascination, or to shun it for the sake of our souls and our sanity. For one thing, the bad odor of the house was strongest there; and for another thing, we did not like the white fungous growths which occasionally sprang up in rainy summer weather from the hard earth floor. Those fungi, grotesquely like the vegetation in the yard outside, were truly horrible in their outlines; detest able parodies of toadstools and Indian pipes, whose like we had never seen in any other situation. They rotted quickly, and at one stage became slightly phosphorescent; so that nocturnal passers-by sometimes spoke of witch-fires glowing behind the broken panes of the fetor-spreading windows. We never—even in our wildest Hallowe'en moods—visited this cellar by night, but in some of our daytime visits could detect the phosphorescence, especially when the day was dark and wet. There was also a subtler thing we often thought we detected—a very strange thing which was, however, merely suggestive at most. I refer to a sort of cloudy whitish pattern on the dirt floor—a vague, shifting deposit of mould or niter which we sometimes thought we could trace amidst the sparse fungous growths near the huge fireplace of the basement kitchen. Once in a while it struck us that this patch bore an uncanny resemblance to a doubled-up human figure, though generally no such kinship existed, and often there was no whitish deposit whatever. On a certain rainy afternoon when this illusion seemed phenomenally strong, and when, in addition, I had fancied I glimpsed a kind of thin, yellowish, shimmering exhalation rising from the nitrous pattern toward the yawning fireplace, I spoke to my uncle about the matter. He smiled at this odd conceit, but it seemed that his smile was tinged with reminiscence. Later I heard that a similar notion entered into some of the wild ancient tales of the common folk—a notion likewise alluding to ghoulish, wolfish shapes taken by smoke from the great chimney, and queer contours assumed by certain of the sinuous tree-roots that thrust their way into the cellar through the loose foundation-stones. NOT till my adult years did my uncle set before me the notes and data which he had collected concerning the shunned house. Dr. Whipple was a sane, conservative physician of the old school, and for all his interest in the place was not eager to encourage young thoughts toward the abnormal. His own view, postulating simply a building and location of markedly unsanitary qualities, had nothing to do with abnormality; but he realized that the very picturesqueness which aroused his own interest would in a boy's fanciful mind take on all manner of gruesome imaginative associations. The doctor was a bachelor; a white-haired, clean-shaven, old-fashioned gentleman, and a local historian of note, who had often broken a lance with such controversial guardians of tradition as Sidney S. Rider and Thomas W. Bicknell. He lived with one man servant in a Georgian homestead with knocker and iron-railed steps, balanced eerily on the steep ascent of North Court Street beside the ancient brick court and colony house where his grandfather —a cousin of that celebrated privateersman, Capt. Whipple, who burnt His Majesty's armed schooner Gaspee in 1772—had voted in the legislature on May 4, 1776, for the independence of the Rhode Island Colony. Around him in the damp, low-ceiled library with the musty white paneling, heavy carved overmantel and small-paned, vine-shaded windows, were the relics and records of his ancient family, among which were many dubious allusions to the shunned house in Benefit Street. That pest spot lies not far distant— for Benefit runs ledgewise just above the court house along the precipitous hill up which the first settlement climbed. When, in the end, my insistent pestering and maturing years evoked from my uncle the hoarded lore I sought, there lay before me a strange enough chronicle. Long-winded, statistical, and drearily genealogical as some of the matter was, there ran through it a continuous thread of brooding, tenacious horror and preternatural malevolence which impressed me even more than it had impressed the good doctor. Separate events fitted together uncannily, and seemingly irrelevant details held mines of hideous possibilities. A new and burning curiosity grew in me, compared to which my boyish curiosity was feeble and inchoate. The first revelation led to an exhaustive research, and finally to that shuddering quest which proved so disastrous to myself and mine. For at last my uncle insisted on joining the search I had commenced, and after a certain night in that house he did not come away with me. I am lonely without that gentle soul whose long years were filled only with honor, virtue, good taste, benevolence, and learning. I have reared a marble urn to his memory in St. John's churchyard—the place that Poe loved—the hidden grove of giant willows on the hill, where tombs and head stones huddle quietly between the hoary bulk of the church and the houses and bank walls of Benefit Street. The history of the house, opening amidst a maze of dates, revealed no trace of the sinister either about its construction or about the prosperous and honorable family who built it. Yet from the first a taint of calamity, soon increased to boding significance, was apparent. My uncle's carefully compiled record began with the building of the structure in 1763, and followed the theme with an unusual amount of detail. The shunned house, it seems, was first inhabited by William Harris and his wife Rhoby Dexter, with their children, Elkanah, born in 1755, Abigail, born in 1757, William, Jr., born in 1759, and Ruth, born in 1761. Harris was a substantial merchant and seaman in the West India trade, connected with the firm of Obadiah Brown and his nephews. After Brown's death in 1761, the new firm of Nicholas Brown & Co. made him master of the brig Prudence, Providence-built, of 120 tons, thus enabling him to erect the new homestead he had desired ever since his marriage. The site he had chosen—a recently straightened part of the new and fashionable Back Street, which ran along the side of the hill above crowded Cheapside—was all that could be wished, and the building did justice to the location. It was the best that moderate means could afford, and Harris hastened to move in before the birth of a fifth child which the family expected. That child, a boy, came in December; but was still-born. Nor was any child to be born alive in that house for a century and a half. The next April sickness occurred among the children, and Abigail and Ruth died before the month was over. Dr. Job Ives diagnosed the trouble as some infantile fever, though others declared it was more of a mere wasting-away or decline. It seemed, in any event, to be contagious; for Hannah Bowen, one of the two servants, died of it in the following June. Eli Lideason, the other servant, constantly complained of weakness; and would have returned to his father's farm in Rehoboth but for a sudden attachment for Mehitabel Pierce, who was hired to succeed Hannah. He died the next year—a sad year in deed, since it marked the death of William Harris himself, enfeebled as he was by the climate of Martinique, where his occupation had kept him for considerable periods during the preceding decade. The widowed Rhoby Harris never recovered from the shock of her husband's death, and the passing of her firstborn Elkanah two years later was the final blow to her reason. In 1768 she fell victim to a mild form of insanity, and was thereafter confined to the upper part of the house, her elder maiden sister, Mercy Dexter, having moved in to take charge of the family. Mercy was a plain, raw-boned woman of great strength, but her health visibly declined from the time of her advent. She was greatly devoted to her unfortunate sister, and had an especial affection for her only surviving nephew William, who from a sturdy infant had become a sickly, spindling lad. In this year the servant Mehitabel died, and the other servant, Preserved Smith, left without coherent explanation—or at least, with only some wild tales and a complaint that he disliked the smell of the place. For a time Mercy could secure no more help, since the seven deaths and case of madness, all occurring within five years' space, had begun to set in motion the body of fireside rumor which later became so bizarre. Ultimately, however, she obtained new servants from out of town; Ann White, a morose woman from that part of North Kingstown now set off as the township of Exeter, and a capable Boston man named Zenas Low. It was Ann White who first gave definite shape to the sinister idle talk. Mercy should have known better than to hire anyone from the Nooseneck Hill country, for that remote bit of backwoods was then, as now, a seat of the most uncomfortable superstitions. As lately as 1892 an Exeter community exhumed a dead body and ceremoniously burnt its heart in order to prevent certain alleged visitations injurious to the public health and peace, and one may imagine the point of view of the same section in 1768. Ann's tongue was perniciously active, and within a few months Mercy discharged her, filling her place with a faithful and amiable Amazon from Newport, Maria Robbins. Meanwhile poor Rhoby Harris, in her madness, gave voice to dreams and imaginings of the most hideous sort. At times her screams became insupportable, and for long periods she would utter shrieking horrors which necessitated her son's temporary residence with his cousin, Peleg Harris, in Presbyterian Lane near the new college building. The boy would seem to improve after these visits, and had Mercy been as wise as she was well-meaning, she would have let him live permanently with Peleg. Just what Mrs. Harris cried out in her fits of violence, tradition hesitates to say; or rather, presents such extravagant accounts that they nullify themselves through sheer absurdity. Certainly it sounds absurd to hear that a woman educated only in the rudiments of French often shouted for hours in a coarse and idiomatic form of that language, or that the same per son, alone and guarded, complained wildly of a staring thing which bit and chewed at her. In 1772 the servant Zenas died, and when Mrs. Harris heard of it she laughed with a shocking delight utterly foreign to her. The next year she herself died, and was laid to rest in the North Burial Ground beside her husband. Upon the outbreak of trouble with Great Britain in 1775, William Harris, despite his scant sixteen years and feeble constitution, man aged to enlist in the Army of Observation under General Greene; and from that time on enjoyed a steady rise in health and prestige. In 1780, as a Captain in Rhode Island forces in New Jersey under Colonel Angell, he met and married Phebe Hetfield of Elizabethtown, whom he brought to Providence upon his honorable discharge in the following year. The young soldier's return was not a thing of unmitigated happiness. The house, it is true, was still in good condition; and the street had been widened and changed in name from Back Street to Benefit Street. But Mercy Dexter's once robust frame had undergone a sag and curious decay, so that she was now a stooped and pathetic figure with hollow voice and disconcerting pallor— qualities shared to a singular degree by the one remaining servant Maria. In the autumn of 1782 Phebe Harris gave birth to a still-born daughter, and on the fifteenth of the next May Mercy Dexter took leave of a useful, austere, and virtuous life. William Harris, at last thoroughly convinced of the radically unhealthful nature of his abode, now took steps toward quitting it and closing it forever. Securing temporary quarters for himself and wife at the newly opened Golden Ball Inn, he arranged for the building of a new and finer house in Westminster Street, in the growing part of the town across the Great Bridge. There, in 1785, his son Dutee was born; and there the family dwelt till the encroachments of commerce drove them back across the river and over the hill to Angell Street, in the newer East Side residence district, where the late Archer Harris built his sumptuous but hideous French-roofed mansion in 1876. William and Phebe both succumbed to the yellow fever epidemic in 1797, but Dutee was brought up by his cousin Rathbone Harris, Peleg's son. Rathbone was a practical man, and rented the Benefit Street house despite William's wish to keep it vacant. He considered it an obligation to his ward to make the most of all the boy's property, nor did he concern himself with the deaths and illnesses which caused so many changes of tenants, or the steadily growing aversion with which the house was generally regarded. It is likely that he felt only vexation when, in 1804, the town council ordered him to fumigate the place with sulphur, tar and gum camphor on account of the much-discussed deaths of four persons, presumably caused by the then diminishing fever epidemic. They said the place had a febrile smell. Dutee himself thought little of the house, for he grew up to be a privateersman, and served with distinction on the Vigilant under Capt. Cahoone in the War of 1812. He returned unharmed, married in 1814, and became a father on that memorable night of September 23, 1815, when a great gale drove the waters of the bay over half the town, and floated a tall sloop well up Westminster Street so that its masts almost tapped the Harris windows in symbolic affirmation that the new boy, Welcome, was a seaman's son. Welcome did not survive his father, but lived to perish gloriously at Fredericksburg in 1862. Neither he nor his son Archer knew of the shunned house as other than a nuisance almost impossible to rent—perhaps on account of the mustiness and sickly odor of unkempt old age. Indeed, it never was rented after a series of deaths culminating in 1861, which the excitement of the war tended to throw into obscurity. Carrington Harris, last of the male line, knew it only as a deserted and somewhat picturesque center of legend until I told him my experience. He had meant to tear it down and build an apartment house on the site, but after my account, decided to let it stand, install plumbing, and rent it. Nor has he yet had any difficulty in obtaining tenants. The horror has gone. IT may well be imagined how powerfully I was affected by the annals of the Harrises. In this continuous record there seemed to me to brood a persistent evil beyond anything in nature as I had known it; an evil clearly connected with the house and not with the family. This impression was confirmed by my uncle's less systematic array of miscellaneous data—legends transcribed from servant gossip, cuttings from the papers, copies of death-certificates by fellow-physicians, and the like. All of this material I cannot hope to give, for my uncle was a tireless antiquarian and very deeply interested in the shunned house; but I may refer to several dominant points which earn notice by their recurrence through many reports from diverse sources. For example, the servant gossip was practically unanimous in attributing to the fungous and malodorous cellar of the house a vast supremacy in evil influence. There had been servants—Ann White especially—who would not use the cellar kitchen, and at least three well-defined legends bore upon the queer quasi-human or diabolic outlines assumed by tree-roots and patches of mould in that region. These latter narratives interested me profoundly, on account of what I had seen in my boyhood, but I felt that most of the significance had in each case been largely obscured by additions from the common stock of local ghost lore. Ann White, with her Exeter superstition, had promulgated the most extravagant and at the same time most consistent tale; alleging that there must lie buried beneath the house one of those vampires—the dead who retain their bodily form and live on the blood or breath of the living—whose hideous legions send their preying shapes or spirits abroad by night. To destroy a vampire one must, the grandmothers say, exhume it and burn its heart, or at least drive a stake through that organ; and Ann's dogged insistence on a search under the cellar had been prominent in bringing about her discharge. Her tales, however, commanded a wide audience, and were the more readily accepted because the house indeed stood on land once used for burial purposes. To me their interest depended less on this circumstance than on the peculiarly appropriate way in which they dove-tailed with certain other things—the complaint of the departing servant Preserved Smith, who had preceded Ann and never heard of her, that something "sucked his breath" at night; the death-certificates of fever victims of 1804, issued by Dr. Chad Hopkins, and showing the four deceased persons all unaccountably lacking in blood; and the obscure passages of poor Rhoby Harris's ravings, where she complained of the sharp teeth of a glassy-eyed, half-visible presence. Free from unwarranted superstition though I am, these things produced in me an odd sensation, which was intensified by a pair of widely separated newspaper cuttings relating to deaths in the shunned house—one from the Providence Gazette and Country-Journal of April 12, 1815, and the other from the Daily Transcript and Chronicle of October 27, 1845—each of which detailed an appallingly grisly circumstance whose duplication was remarkable. It seems that in both instances the dying person, in 1815 a gentle old lady named Stafford and in 1845 a school-teacher of middle age named Eleazar Durfee, became transfigured in a horrible way; glaring glassily and attempting to bite the throat of the attending physician. Even more puzzling, though, was the final case which put an end to the renting of the house— a series of anemia deaths preceded by progressive madnesses wherein the patient would craftily attempt the lives of his relatives by incisions in the neck or wrists. This was in 1860 and 1861, when my uncle had just begun his medical practice; and before leaving for the front he heard much of it from his elder professional colleagues. The really inexplicable thing was the way in which the victims—ignorant people, for the ill-smelling and widely shunned house could now be rented to no others—would babble maledictions in French, a language they could not possibly have studied to any extent. It made one think of poor Rhoby Harris nearly a century before, and so moved my uncle that he commenced collecting historical data on the house after listening, some time subsequent to his return from the war, to the first-hand account of Drs. Chase and Whitmarsh. Indeed, I could see that my uncle had thought deeply on the subject, and that he was glad of my own interest—an open-minded and sympathetic interest which enabled him to discuss with me matters at which others would merely have laughed. His fancy had not gone so far as mine, but he felt that the place was rare in its imaginative potentialities, and worthy of note as an inspiration in the field of the grotesque and macabre. For my part, I was disposed to take the whole subject with profound seriousness, and began at once not only to review the evidence, but to accumulate as much as I could. I talked with the elderly Archer Harris, then owner of the house, many times before his death in 1916; and obtained from him and his still surviving maiden sister Alice an authentic corroboration of all the family data my uncle had collected. When, however, I asked them what connection with France or its language the house could have, they confessed themselves as frankly baffled and ignorant as I. Archer knew nothing, and all that Miss Harris could say was that an old allusion her grandfather, Dutee Harris, had heard of might have shed a little light. The old seaman, who had survived his son Welcome's death in battle by two years, had not himself known the legend; but recalled that his earliest nurse, the ancient Maria Robbins, seemed darkly aware of something that might have lent a weird significance to the French ravings of Rhoby Harris, which she had so often heard during the last days of that hapless woman. Maria had been at the shunned house from 1769 till the removal of the family in 1783, and had seen Mercy Dexter die. Once she hinted to the child Dutee of a somewhat peculiar circumstance in Mercy's last moments, but he had soon forgotten all about it save that it was something peculiar. The grand daughter, moreover, recalled even this much with difficulty. She and her brother were not so much interested in the house as was Archer's son Carrington, the present owner, with whom I talked after my experience. Having exhausted the Harris family of all the information it could furnish, I turned my attention to early town records and deeds with a zeal more penetrating than that which my uncle had occasionally shown in the same work. What I wished was a comprehensive history of the site from its very settlement in 1636—or even before, if any Narragansett Indian legend could be unearthed to supply the data. I found, at the start, that the land had been part of a long strip of the lot granted originally to John Throckmorton; one of many similar strips beginning at the Town Street beside the river and extending up over the hill to a line roughly corresponding with the modern Hope Street. The Throckmorton lot had later, of course, been much subdivided; and I became very assiduous in tracing that section through which Back or Benefit Street was later run. It had, a rumor indeed said, been the Throckmorton graveyard; but as I examined the records more carefully, I found that the graves had all been transferred at an early date to the North Burial Ground on the Pawtucket West Road. Then suddenly I came—by a rare piece of chance, since it was not in the main body of records and might easily have been missed—upon something which aroused my keenest eagerness, fitting in as it did with several of the queerest phases of the affair. It was the record of a lease in 1697, of a small tract of ground to an Etienne Roulet and wife. At last the French element had appeared—that, and another deeper element of horror which the name conjured up from the darkest recesses of my weird and heterogeneous reading—and I feverishly studied the platting of the locality as it had been before the cutting through and partial straightening of Back Street between 1747 and 1758. 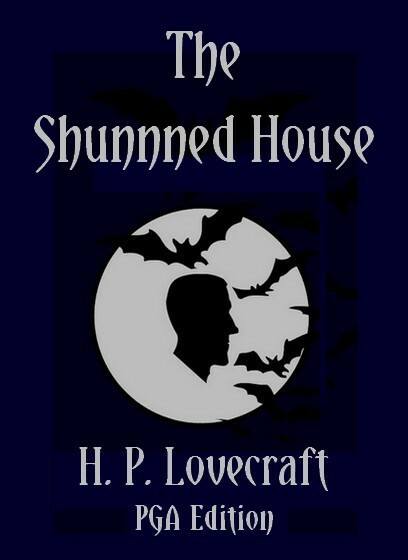 I found what I had half expected, that where the shunned house now stood, the Roulets had laid out their graveyard behind a one-story and attic cottage, and that no record of any transfer of graves existed. The document, indeed, ended in much confusion; and I was forced to ransack both the Rhode Island Historical Society and Shepley Library before I could find a local door which the name of Etienne Roulet would unlock. In the end I did find something; something of such vague but monstrous import that I set about at once to examine the cellar of the shunned house itself with a new and excited minuteness. The Roulets, it seemed, had come in 1696 from East Greenwich, down the west shore of Narragansett Bay. They were Huguenots from Caude, and had encountered much opposition before the Providence selectmen allowed them to settle in the town. Unpopularity had dogged them in East Greenwich, whither they had come in 1686, after the revocation of the Edict of Nantes, and rumor said that the cause of dislike extended beyond mere racial and national prejudice, or the land disputes which involved other French settlers with the English in rivalries which not even Governor Andros could quell. But their ardent Protestantism—too ardent, some whispered—and their evident distress when virtually driven from the village had been granted a haven; and the swarthy Etienne Roulet, less apt at agriculture than at reading queer books and drawing queer diagrams, was given a clerical post in the warehouse at Pardon Tillinghast's wharf, far south in Town Street. There had, however, been a riot of some sort later on—perhaps forty years later, after old Roulet's death—and no one seemed to hear of the family after that. For a century and more, it appeared, the Roulets had been well remembered and frequently discussed as vivid incidents in the quiet life of a New England seaport. Etienne's son Paul, a surly fellow whose erratic conduct had probably provoked the riot which wiped out the family, was particularly a source of speculation; and though Providence never shared the witchcraft panics of her Puritan neighbors, it was freely intimated by old wives that his prayers were neither uttered at the proper time nor directed toward the proper object. All this had undoubtedly formed the basis of the legend known by old Maria Robbins. What relation it had to the French ravings of Rhoby Harris and other inhabitants of the shunned house, imagination or future discovery alone could determine. I wondered how many of those who had known the legends realized that additional link with the terrible which my wider reading had given me; that ominous item in the annals of morbid horror which tells of the creature Jacques Roulet, of Caude, who in 1598 was condemned to death as a daemoniac but afterward saved from the stake by the Paris parliament and shut in a madhouse. He had been found covered with blood and shreds of flesh in a wood, shortly after the killing and rending of a boy by a pair of wolves. One wolf was seen to lope away unhurt. Surely a pretty hearthside tale, with a queer significance as to name and place; but I decided that the Providence gossips could not have generally known of it. Had they known, the coincidence of names would have brought some drastic and frightened action—indeed, might not its limited whispering have precipitated the final riot which erased the Roulets from the town? I now visited the accursed place with increased frequency; studying the unwholesome vegetation of the garden, examining all the walls of the building, and poring over every inch of the earthen cellar floor. Finally, with Carrington Harris's permission, I fitted a key to the disused door opening from the cellar directly upon Benefit Street, preferring to have a more immediate access to the outside world than the dark stairs, ground floor hall, and front door could give. There, where morbidity lurked most thickly, I searched and poked during long afternoons when the sunlight filtered in through the cobwebbed above-ground door which placed me only a few feet from the placid sidewalk outside. Nothing new rewarded my efforts—only the same depressing mustiness and faint suggestions of noxious odors and nitrous outlines on the floor—and I fancy that many pedestrians must have watched me curiously through the broken panes. At length, upon a suggestion of my uncle's, I decided to try the spot nocturnally; and one stormy midnight ran the beams of an electric torch over the mouldy floor with its uncanny shapes and distorted, half-phosphorescent fungi. The place had dispirited me curiously that evening, and I was almost prepared when I saw—or thought I saw—amidst the whitish deposits a particularly sharp definition of the "huddled form" I had suspected from boyhood. Its clearness was astonishing and unprecedented—and as I watched I seemed to see again the thin, yellowish, shimmering exhalation which had startled me on that rainy afternoon so many years before. Above the anthropomorphic patch of mould by the fireplace it rose; a subtle, sickish, almost luminous vapor which, as it hung trembling in the dampness, seemed to develop vague and shocking suggestions of form, gradually trailing off into nebulous decay and passing up into the blackness of the great chimney with a fetor in its wake. It was truly horrible, and the more so to me because of what I knew of the spot. Refusing to flee, I watched it fade —and as I watched I felt that it was in turn watching me greedily with eyes more imaginable than visible. When I told my uncle about it he was greatly aroused; and after a tense hour of reflection, arrived at a definite and drastic decision. Weighing in his mind the importance of the matter, and the significance of our relation to it, he insisted that we both test—and if possible destroy—the horror of the house by a joint night or nights of aggressive vigil in that musty and fungous-cursed cellar. ON Wednesday, June 25, 1919, after a proper notification of Carrington Harris which did not include surmises as to what we expected to find, my uncle and I conveyed to the shunned house two camp chairs and a folding camp cot, together with some scientific mechanism of greater weight and intricacy. These we placed in the cellar during the day, screening the windows with paper and planning to return in the evening for our first vigil. We had locked the door from the cellar to the ground floor; and having a key to the outside cellar door, we were prepared to leave our expensive and delicate apparatus— which we had obtained secretly and at great cost—as many days as our vigil might need to be protracted. It was our design to sit up together till very late, and then watch singly till dawn in two-hour stretches, myself first and then my companion; the inactive member resting on the cot. The natural leadership with which my uncle procured the instruments from the laboratories of Brown University and the Cranston Street Armory, and instinctively assumed direction of our venture, was a marvelous commentary on the potential vitality and resilience of a man of eighty-one. Elihu Whipple had lived according to the hygienic laws he had preached as a physician, and but for what happened later would be here in full vigor today. Only two persons suspect what did happen—Carrington Harris and myself. I had to tell Harris because he owned the house and deserved to know what had gone out of it. Then, too, we had spoken to him in advance of our quest; and I felt after my uncle's going that he would understand and assist me in some vitally necessary public explanations. He turned very pale, but agreed to help me, and decided that it would now be safe to rent the house. To declare that we were not nervous on that rainy night of watching would be an exaggeration both gross and ridiculous. We were not, as I have said, in any sense childishly superstitious, but scientific study and reflection had taught us that the known universe of three dimensions embraces the merest fraction of the whole cosmos of substance and energy. In this case an overwhelming preponderance of evidence from numerous authentic sources pointed to the tenacious existence of certain forces of great power and, so far as the human point of view is concerned, exceptional malignancy. To say that we actually believed in vampires or werewolves would be a carelessly inclusive statement. Rather must it be said that we were not prepared to deny the possibility of certain unfamiliar and unclassified modifications of vital force and attenuated matter; existing very infrequently in three-dimensional space because of its more intimate connection with other spatial units, yet close enough to the boundary of our own to furnish us occasional manifestations which we, for lack of a proper vantage-point, may never hope to understand. In short, it seemed to my uncle and me that an incontrovertible array of facts pointed to some lingering influence in the shunned house; traceable to one or another of the ill-favored French settlers of two centuries before, and still operative through rare and unknown laws of atomic and electronic motion. That the family of Roulet had possessed an abnormal affinity for outer circles of entity—dark spheres which for normal folk hold only repulsion and terror—their recorded history seemed to prove. Had not, then, the riots of those bygone seventeen-thirties set moving certain kinetic patterns in the morbid brain of one or more of them—notably the sinister Paul Roulet —which obscurely survived the bodies murdered, and continued to function in some multiple-dimensioned space along the original lines of force determined by a frantic hatred of the encroaching community? Such a thing was surely not a physical or biochemical impossibility in the light of a newer science which includes the theories of relativity and intra-atomic action. One might easily imagine an alien nucleus of substance or energy, formless or otherwise, kept alive by imperceptible or immaterial subtractions from the life-force or bodily tissue and fluids of other and more palpably living things into which it penetrates and with whose fabric it sometimes completely merges itself. It might be actively hostile, or it might be dictated merely by blind motives of self-preservation. In any case such a monster must of necessity be in our scheme of things an anomaly and an intruder, whose extirpation forms a primary duty with every man not an enemy to the world's life, health, and sanity. What baffled us was our utter ignorance of the aspect in which we might encounter the thing. No sane person had even seen it, and few had ever felt it definitely. It might be pure energy—a form ethereal and outside the realm of substance—or it might be partly material; some unknown and equivocal mass of plasticity, capable of changing at will to nebulous approximations of the solid, liquid, gaseous, or tenuously unparticled states. The anthropomorphic patch of mould on the floor, the form of the yellowish vapor, and the curvature of the tree-roots in some of the old tales, all argued at least a remote and reminiscent connection with the human shape; but how representative or permanent that similarity might be, none could say with any kind of certainty. We had devised two weapons to fight it; a large and specially fitted Crookes tube operated by powerful storage batteries and provided with peculiar screens and reflectors, in case it proved intangible and opposable only by vigorously destructive ether radiations, and a pair of military flame-throwers of the sort used in the World War, in case it proved partly material and susceptible of mechanical destruction—for like the superstitious Exeter rustics, we were prepared to burn the thing's heart out if heart existed to burn. All this aggressive mechanism we set in the cellar in positions carefully arranged with reference to the cot and chairs, and to the spot before the fireplace where the mould had taken strange shapes. That suggestive patch, by the way, was only faintly visible when we placed our furniture and instruments, and when we returned that evening for the actual vigil. For a moment I half-doubted that I had ever seen it in the more definitely limned form—but then I thought of the legends. Our cellar vigil began at 10 P.M., daylight saving time, and as it continued we found no promise of pertinent developments. A weak, filtered glow from the rain-harassed street lamps outside, and a feeble phosphorescence from the detestable fungi within, showed the dripping stone of the walls, from which all traces of whitewash had vanished; the dank, fetid and mildew-tainted hard earth floor with its obscene fungi; the rotting remains of what had been stools, chairs and tables, and other more shapeless furniture; the heavy planks and massive beams of the ground floor overhead; the decrepit plank door leading to bins and chambers beneath other parts of the house; the crumbling stone staircase with ruined wooden hand-rail; and the crude and cavernous fireplace of blackened brick where rusted iron fragments revealed the past presence of hooks, andirons, spit, crane, and a door to the Dutch oven—these things, and our austere cot and camp chairs, and the heavy and intricate destructive machinery we had brought. We had, as in my own former explorations, left the door to the street unlocked; so that a direct and practical path of escape might lie open in case of manifestations beyond our power to deal with. It was our idea that our continued nocturnal presence would call forth whatever malign entity lurked there; and that being prepared, we could dispose of the thing with one or the other of our provided means as soon as we had recognized and observed it sufficiently. How long it might require to evoke and extinguish the thing, we had no notion. It occurred to us, too, that our venture was far from safe, for in what strength the thing might appear no one could tell. But we deemed the game worth the hazard, and embarked on it alone and unhesitatingly; conscious that the seeking of outside aid would only expose us to ridicule and perhaps defeat our entire purpose. Such was our frame of mind as we talked—far into the night, till my uncle's growing drowsiness made me remind him to lie down for his two-hour sleep. Something like fear chilled me as I sat there in the small hours alone —I say alone, for one who sits by a sleeper is indeed alone; perhaps more alone than he can realize. My uncle breathed heavily, his deep inhalations and exhalations accompanied by the rain outside, and punctuated by another nerve-racking sound of distant dripping water within—for the house was repulsively damp even in dry weather, and in this storm positively swamp-like. I studied the loose, antique-masonry of the walls in the fungous-light and the feeble rays which stole in from the street through the screened windows; and once, when the noisome atmosphere of the place seemed about to sicken me, I opened the door and looked up and down the street, feasting my eyes on familiar sights and my nostrils on wholesome air. Still nothing occurred to reward my watching; and I yawned repeatedly, fatigue getting the better of apprehension. Then the stirring of my uncle in his sleep attracted my notice. He had turned restlessly on the cot several times during the latter half of the first hour, but now he was breathing with unusual irregularity, occasionally heaving a sigh which held more than a few of the qualities of a choking moan. I turned my electric flashlight on him and found his face averted, so rising and crossing to the other side of the cot, I again flashed the light to see if he seemed in any pain. What I saw unnerved me most surprisingly, considering its relative triviality. It must have been merely the association of an odd circumstance with the sinister nature of our location and mission, for surely the circumstance was not in itself frightful or unnatural. It was merely that my uncle's facial expression, disturbed no doubt by the strange dreams which our situation prompted, betrayed consider able agitation, and seemed not at all characteristic of him. His habitual expression was one of kindly and well-bred calm, whereas now a variety of emotions seemed struggling within him. I think, on the whole, that it was this variety which chiefly disturbed me. My uncle, as he gasped and tossed in increasing perturbation and with eyes that had now started open, seemed not one man but many men, and suggested a curious quality of alienage from himself. All at once he commenced to mutter, and I did not like the look of his mouth and teeth as he spoke. The words were at first indistinguishable, and then—with a tremendous start—I recognized some thing about them which filled me with icy fear till I recalled the breadth of my uncle's education and the interminable translations he had made from anthropological and antiquarian articles in the Revue des Deux Mondes. For the venerable Elihu Whipple was muttering in French, and the few phrases I could distinguish seemed connected with the darkest myths he had ever adapted from the famous Paris magazine. Suddenly a perspiration broke out on the sleeper's forehead, and he leaped abruptly up, half awake. The jumble of French changed to a cry in English, and the hoarse voice shouted excitedly, "My breath, my breath!" Then the awakening became complete, and with a subsidence of facial expression to the normal state my uncle seized my hand and began to relate a dream whose nucleus of significance I could only surmise with a kind of awe. He had, he said, floated off from a very ordinary series of dream- pictures into a scene whose strangeness was related to nothing he had ever read. It was of this world, and yet not of it—a shadowy geometrical confusion in which could be seen elements of familiar things in most unfamiliar and perturbing combinations. There was a suggestion of queerly disordered pictures superimposed one upon an other; an arrangement in which the essentials of time as well as of space seemed dissolved and mixed in the most illogical fashion. In this kaleidoscopic vortex of phantasmal images were occasional snap-shots, if one might use the term, of singular clearness but unaccountable heterogeneity. Once my uncle thought he lay in a carelessly dug open pit, with a crowd of angry faces framed by straggling locks and three-cornered hats frowning down at him. Again he seemed to be in the interior of a house—an old house, apparently—but the details and inhabitants were constantly changing, and he could never be certain of the faces or the furniture, or even of the room itself, since doors and windows seemed in just as great a state of flux as the more presumably mobile objects. It was queer—damnably queer— and my uncle spoke almost sheepishly, as if half expecting not to be believed, when he declared that of the strange faces many had unmistakably borne the features of the Harris family. And all the while there was a personal sensation of choking, as if some pervasive presence had spread itself through his body and sought to possess itself of his vital processes. I shuddered at the thought of those vital processes, worn as they were by eighty-one years of continuous functioning, in conflict with unknown forces of which the youngest and strongest system might well be afraid; but in another moment reflected that dreams are only dreams, and that these uncomfortable visions could be, at most, no more than my uncle's reaction to the investigations and expectations which had lately filled our minds to the exclusion of all else. Conversation, also, soon tended to dispel my sense of strangeness; and in time I yielded to my yawns and took my turn at slumber. My uncle seemed now very wakeful, and welcomed his period of watching even though the nightmare had aroused him far ahead of his allotted two hours. Sleep seized me quickly, and I was at once haunted with dreams of the most disturbing kind. I felt, in my visions, a cosmic and abysmal loneness; with hostility surging from all sides upon some prison where I lay confined. I seemed bound and gagged, and taunted by the echoing yells of distant multitudes who thirsted for my blood. My uncle's face came to me with less pleasant associations than in waking hours, and I recall many futile struggles and at tempts to scream. It was not a pleasant sleep, and for a second I was not sorry for the echoing shriek which clove through the barriers of dream and flung me to a sharp and startled awakeness in which every actual object before my eyes stood out with more than natural clearness and reality. I HAD been lying with my face away from my uncle's chair, so that in this sudden flash of awakening I saw only the door to the street, the more northerly window, and the wall and floor and ceiling toward the north of the room, all photographed with morbid vividness on my brain in a light brighter than the glow of the fungi or the rays from the street outside. It was not a strong or even a fairly strong light; certainly not nearly strong enough to read an average book by. But it cast a shadow of myself and the cot on the floor, and had a yellowish, penetrating force that hinted at things more portent than luminosity. This I perceived with unhealthy sharpness despite the fact that two of my other senses were violently assailed. For on my ears rang the reverberations of that shocking scream, while my nostrils revolted at the stench which filled the place. My mind, as alert as my senses, recognized the gravely unusual; and almost automatically I leaped up and turned about to grasp the destructive instruments which we had left trained on the mouldy spot before the fireplace. As I turned, I dreaded what I was to see; for the scream had been in my uncle's voice, and I knew not against what menace I should have to defend him and myself. Yet after all, the sight was worse than I had dreaded. There are horrors beyond horrors, and this was one of those nuclei of all dreamable hideousness which the cosmos saves to blast an accursed and unhappy few. Out of the fungous-ridden earth steamed up a vaporous corpse-light, yellow and diseased, which bubbled and lapped to a gigantic height in vague outlines half human and half monstrous, through which I could see the chimney and fireplace beyond. It was all eyes—wolfish and mocking—and the rugose insect-like head dissolved at the top to a thin stream of mist which curled putridly about and finally vanished up the chimney. I say that I saw this thing, but it is only in conscious retrospection that I ever definitely traced its damnable approach to form. At the time it was to me only a seething dimly phosphorescent cloud of fungous loathsomeness, enveloping and dissolving to an abhorrent plasticity the one object to which all my attention was focused. That object was my uncle —the venerable Elihu Whipple—who with blackening and decaying features leered and gibbered at me, and reached out dripping claws to rend me in the fury which this horror had brought. It was a sense of routine which kept me from going mad. I had drilled myself in preparation for the crucial moment, and blind training saved me. Recognizing the bubbling evil as no substance reach able by matter or material chemistry, and therefore ignoring the flame-thrower which loomed on my left, I threw on the current of the Crookes tube apparatus, and focussed toward that scene of immortal blasphemousness the strongest ether radiations which men's art can arouse from the spaces and fluids of nature. There was a bluish haze and a frenzied sputtering, and the yellowish phosphorescence grew dimmer to my eyes. But I saw the dimness was only that of contrast, and that the waves from the machine had no effect whatever. Then, in the midst of that daemoniac spectacle, I saw a fresh horror which brought cries to my lips and sent me fumbling and staggering towards that unlocked door to the quiet street, careless of what abnormal terrors I loosed upon the world, or what thoughts or judgments of men I brought down upon my head. In that dim blend of blue and yellow the form of my uncle had commenced a nauseous liquefaction whose essence eludes all description, and in which there played across his vanishing face such changes of identity as only madness can conceive. He was at once a devil and a multitude, a charnel-house and a pageant. Lit by the mixed and uncertain beams, that gelatinous face assumed a dozen—a score—a hundred—aspects; grinning, as it sank to the ground on a body that melted like tallow, in the caricatured likeness of legions strange and yet not strange. I saw the features of the Harris line, masculine and feminine, adult and infantile, and other features old and young, coarse and refined, familiar and unfamiliar. For a second there flashed a degraded counterfeit of a miniature of poor Rhoby Harris that I had seen in the School of Design Museum, and another time I thought I caught the rawboned image of Mercy Dexter as I recalled her from a painting in Carrington Harris's house. It was frightful beyond conception; toward the last, when a curious blend of servant and baby visages flickered close to the fungous floor where a pool of greenish grease was spreading, it seemed as though the shifting features fought against themselves, and strove to form contours like those of my uncle's kindly face. I like to think that he existed at that moment, and that he tried to bid me farewell. It seems to me I hiccoughed a farewell from my own parched throat as I lurched out into the street; a thin stream of grease following me through the door to the rain-drenched sidewalk. The rest is shadowy and monstrous. There was no one in the soaking street, and in all the world there was no one I dared tell. I walked aimlessly south past College Hill and the Athenaeum, down Hopkins Street, and over the bridge to the business section where tall buildings seemed to guard me as modern material things guard the world from ancient and unwholesome wonder. Then the grey dawn unfolded wetly from the east, silhouetting the archaic hill and its venerable steeples, and beckoning me to the place where my terrible work was still unfinished. And in the end I went, wet, hatless, and dazed in the morning light, and entered that awful door in Benefit Street which I had left ajar, and which still swung cryptically in full sight of the early householders to whom I dared not speak. The grease was gone, for the mouldy floor was porous. And in front of the fireplace was no vestige of the giant doubled-up form in niter. I looked at the cot, the chairs, the instruments, my neglected hat, and the yellowed straw hat of my uncle. Dazedness was uppermost, and I could scarcely recall what was dream and what was reality. Then thought trickled back, and I knew that I had witnessed things more horrible than I had dreamed. Sitting down, I tried to conjecture as nearly as sanity would let me just what had happened, and how I might end the horror, if indeed it had been real. Matter it seemed not to be, nor ether, nor anything else conceivable by mortal mind. What, then, but some exotic emanation; some vampirish vapor such as Exeter rustics tell of as lurking over certain church yards? This I felt was the clue, and again I looked at the floor before the fireplace where the mould and niter had taken strange forms. In ten minutes my mind was made up, and taking my hat I set out for home, where I bathed, ate, and gave by telephone an order for a pick-axe, a spade, a military gas-mask, and six carboys of sulphuric acid, all to be delivered the next morning at the cellar door of the shunned house in Benefit Street. After that I tried to sleep; and failing, passed the hours in reading and in the composition of inane verses to counteract my mood. At 11 A.M. the next day I commenced digging. It was sunny weather, and I was glad of that. I was still alone, for as much as I feared the unknown horror I sought, there was more fear in the thought of telling anybody. Later I told Harris only through sheer necessity, and because he had heard odd tales from old people which disposed him ever so little toward belief. As I turned up the stinking black earth in front of the fireplace, my spade causing a viscous yellow ichor to ooze from the white fungi which it severed, I trembled at the dubious thoughts of what I might uncover. Some secrets of inner earth are not good for mankind, and this seemed to me one of them. My hand shook perceptibly, but still I delved; after a while standing in the large hole I had made. With the deepening of the hole, which was about six feet square, the evil smell increased; and I lost all doubt of my imminent contact with the hellish thing whose emanations had cursed the house for over a century and a half. I wondered what it would look like—what its form and substance would be, and how big it might have waxed through long ages of life-sucking. At length I climbed out of the hole and dispersed the heaped-up dirt, then arranging the great carboys of acid around and near two sides, so that when necessary I might empty them all down the aperture in quick succession. After that I dumped earth only along the other two sides; working more slowly and donning my gas-mask as the smell grew. I was nearly unnerved at my proximity to a nameless thing at the bottom of a pit. Suddenly my spade struck something softer than earth. I shuddered and made a motion as if to climb out of the hole, which was now as deep as my neck. Then courage returned, and I scraped away more dirt in the light of the electric torch I had provided. The surface I uncovered was fishy and glassy —a kind of semi-putrid congealed jelly with suggestions of translucency. I scraped further, and saw that it had form. There was a rift where a part of the substance was folded over. The exposed area was huge and roughly cylindrical; like a mammoth soft blue-white stovepipe doubled in two, its largest part some two feet in diameter. Still more I scraped, and then abruptly I leaped out of the hole and away from the filthy thing; frantically unstopping and tilting the heavy carboys, and precipitating their corrosive contents one after another down that charnel gulf and upon this unthinkable abnormality whose titan elbow I had seen. The blinding maelstrom of greenish-yellow vapor which surged tempestuously up from that hole as the floods of acid descended, will never leave my memory. All along the hill people tell of the yellow day, when virulent and horrible fumes arose from the factory waste dumped in the Providence River, but I know how mistaken they are as to the source. They tell, too, of the hideous roar which at the same time came from some disordered water-pipe or gas main underground—but again I could correct them if I dared. It was unspeakably shocking, and I do not see how I lived through it. I did faint after emptying the fourth carboy, which I had to handle after the fumes had begun to penetrate my mask; but when I recovered I saw that the hole was emitting no fresh vapors. The two remaining carboys I emptied down without particular result, and after a time I felt it safe to shovel the earth back into the pit. It was twilight before I was done, but fear had gone out of the place. The dampness was less fetid, and all the strange fungi had withered to a kind of harmless grayish powder which blew ashlike along the floor. One of earth's nethermost terrors had perished forever; and if there be a hell, it had received at last the daemon soul of an unhallowed thing. And as I patted down the last spadeful of mould, I shed the first of many tears with which I have paid unaffected tribute to my beloved uncle's memory. The next spring no more pale grass and strange weeds came up in the shunned house's terraced garden, and shortly afterward Carrington Harris rented the place. It it still spectral, but its strangeness fascinates me, and I shall find mixed with my relief a queer regret when it is torn down to make way for a tawdry shop or vulgar apartment building. The barren old trees in the yard have begun to bear small, sweet apples, and last year the birds nested in their gnarled boughs.